What (or who) is the Graduate Writing Coach at Annenberg? What is the Graduate Writing Coach? The Graduate Writing Coach is a free resource for graduate students in the Annenberg School of Communication. Graduate school can be a challenging time, and navigating its academic conventions can be equally perplexing. Because of this, the Writing Coach assists graduate students in addressing and developing their writing skills to develop stronger, more independent, and self-sufficient writers and editors. Additionally, the Writing Coach instructs students in best practices for graduate-level academic writing through individual appointments and group tutoring sessions, as well as workshops. Who is the Graduate Writing Coach? Francesca Gacho (PhD, ABD) joined the Annenberg School of Communication staff as the Graduate Writing Coach in the Spring 2017 semester. She also works as a Writing Consultant at a graduate student-only Writing Center and teaches graduate writing and reading courses for first-semester international graduate students, in addition to teaching first-year composition courses at the undergraduate level. She has been teaching and tutoring since 2006 and has been working with graduate student writers since 2012. 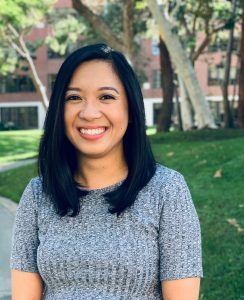 She is currently a doctoral candidate in English and received her MA and BA in English from Claremont Graduate University and CSU Fullerton, respectively. What can I expect from conferences with the Writing Coach? Each 50-minute conference with the Writing Coach is student-directed. This means students decide what the focus of the session will be. With the Writing Coach, the student will set an agenda for the session at the beginning of the conference to make the meeting as productive as possible. Students are required to submit a Pre-Session Form prior to their conference. Successful sessions typically address global issues first (larger issues in writing related to answering the prompt/assignment, thesis statement, argumentation, organization and logical structure of arguments, incorporating sources, coherence, and unity). Similarly, students who come prepared with specific questions about their writing typically leave the meetings with practical strategies that they can then employ when writing on their own. Pertinent documents such as assignment prompt, primary and/or secondary sources, samples (if available) can be helpful during the session, though not required. In 50-minutes, it is typical to read and revise about 4-5 pages of a text, depending on the issues that may be apparent in the text. Each session–just as each writer–is different and develops at its own pace. Conferences are not proofreading or copyediting sessions, though grammar and style are valid and welcome topics of discussion. The Writing Coach provides non-evaluative feedback (as in no comments about what grade the assignment could get); rather, the Writing Coach provides feedback on the degree to which the assignment fulfills assignment requirements, meets genre expectations and academic conventions, and employs rhetorical features of the text to meet its purpose. At the end of each session, the Writing Coach and the student will decide on action items to complete before the next appointment or before submitting the assignment. This entry was posted in GWC. Bookmark the permalink.